Physiotherapists, top-sportsmen and fitness-experts have developed most innovative trainings methods for our io-Ball. This new trainings concept differs clearly between exercises of locomotor and postural musculature. The performance speed will be assigned to especially those muscle fibres types. The locomotor musculature consists of big parts of extremety musculatur which is found in arms and legs. Those are parallel fibred and therefore suitable for specially fast movements. The postural muscles consist of big parts of body muscles, especially stomach muscles as well as gluteal muscle. Those are feathered and able to have big power. The starting point for many movements is the spinal column and all are counterbalanced by the trunk. The spinal column is belted and stabilized by trunk musculature and thus protected against accidental load and overload. To strengthen the stabilizing postural muscles has priority to the locomotor muscles and is at first place when doing io-Ball exercises. For all exercises to strengthen the muscles or the joint-mobilization with the io-Ball we advice: make 8 to 16 repetitions, at 3 to 5 serials. We wish you lots of fun and trust your creativity! Have an additional look at our io-Ball videos, to get an optimal picture of the different areas of application, which are possible due to the elliptic form of the io-Ball. 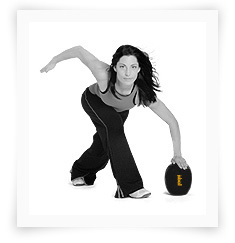 With our unique io-Ball Quick-Push exercises our whole stabilizing muscles are trained optimally. Coordination and concentration will also advance to a new level. The standing position is hip-wide, the knees are lightly bent. Hold your arms in front of body, nearly straight. Your hands hold the io-Ball diagonally then press both your palms approx. 10-15 sec with utmost speed against the io-Ball. Concentrate doing it symmetrically and with smallest moves. The moves are coordinated with your shoulder muscles. The elbow and wrist joints stay passive and in neutral position. The shown strengthening exercises strengthen your back muscles, your rear tight muscles, gluteal muscles and your pelvis muscles. Go into supine position. Bend your legs in an angle and position both feet hip wide on the io-Ball, which lies lengthwise and diagonally to you. 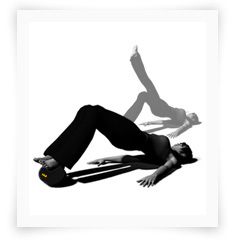 Lift your bottom and stretch your hips up till the tummy-button “falls” into your pelvis. Tense your buttock-muscles a little before you lift your pelvis. Training of the postural muscles: Keep your position now for a few seconds. The shoulder blades stay in contact with the floor and your pelvis lifted. Training of the locomotor muscles: Alternately lower and lift your bottom. Lift and lower a leg alternately. Variations of exercises:You can control your training level by adjusting the position of the io-Ball, whilst positioning it lengthwise towards you. Make this exercise with only one foot standing on the Ball to reach an even higher intensity. The shown exercise helps to strengthen your stomach muscles and your leg muscles. Go into supine position. Bend your legs in an angle and position both your heels hip-wide on the floor. Now stick the io-Ball diagonally or lengthwise, depending on the width of your hips, between your knees. Please consider that no inner rotation of the joint is carried out. The hands you keep at the side of your head but should not lift your head actively. Training of the postural muscles: Press both legs symmetrically against the io-Ball. Lift your upper body and keep that position for a few seconds (10-15 seconds). Training of the locomotor muscles: Lift and lower your upper body alternately. Variations of exercises: Stretch and bend one leg diagonal upwards alternately. A lot of exercises will follow shortly! Since you recognized the principle by now, you can use your creativity and a lot of Pilates-, Yoga- and fitness exercises will be intensified by the io-Ball. The used muscles adjust itself to the strengthening training relatively fast. This explains the chosen elliptic form of our original io-Ball. Due to the different alignments of the equipment and changing requirements one can cause continuous new stimulation. Fundamentally conclusive is the air volume in the io-Ball. In general your ligaments, capsules and cartilages need a longer adjustment time. By gentle joint movements the mobilization- and coordination are perfectly supplied with nutrients and the articular metabolism of the joints will be stimulated. The new io-Ball Foundation training concept is a symbiosis of breathing-technique, strengthening exercises, coordination and mobility. Our elliptic formed io-Ball helps you to reach higher precision, better control and centring at the training. The goal is, to intensify the core musculatur to raise the balance and the flexibility as well as to improve the whole sensomotoric. 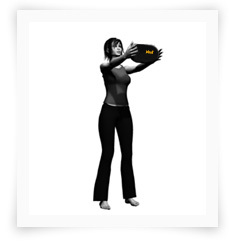 The special Give-Me-Five Workshop of rs-Quality-Training introduces you to the io-Ball training. Experience an intensive trainings day with top trainers, which guarantee the highest quality and will be lots of fun.